This posting discusses software driver genius Pro 8.0 that works for almost all drivers are installed on your computer. little explanation of this software. Driver Genius Professional is a professional driver management tool features both driver management and hardware diagnostics. 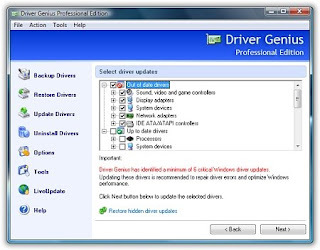 Driver Genius provides such practical functions as driver backup, restoration, update and removal for computer users. If you often reinstall your operating system, you may not forget such painful experiences of searching all around for all kinds of drivers. If unfortunately you have lost your driver CD, the search will be more troublesome and time-consuming.